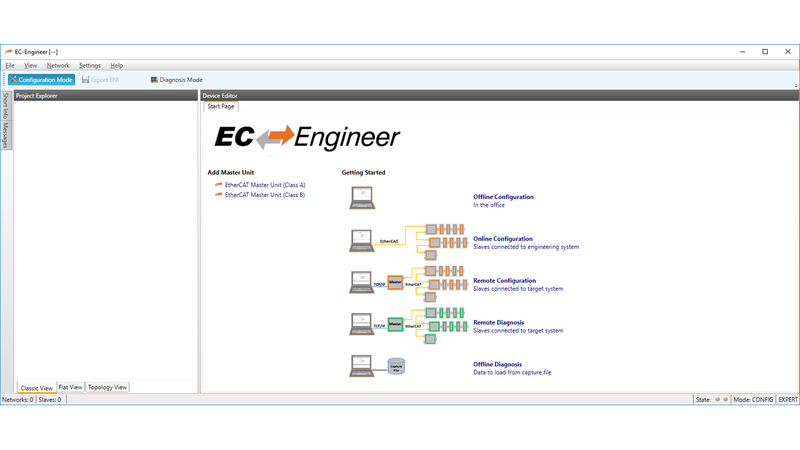 The EC-Engineer is a powerful software tool used for configuration and diagnosis of EtherCAT® networks. Using this single tool one can handle all required engineering and diagnosis tasks in a quick and comfortable way. The modern, clear and very intuitive user interface, which is also rarely using popup dialogs, is crucial for a smooth experience in configuring and diagnosis of customer&apos;s EtherCAT® systems. Using the EC-Engineer the EtherCAT configuration can be done "offline" in the lab/office or "online" when connected with the real EtherCAT network on the machine. It doesn&apos;t matter whether the EtherCAT slaves are connected with the local Windows PC where the EC-Engineer is running or with the control system where the control application&apos;s master stack is running. In either case the slaves and the network topology can easily be determined using the "Bus-Scan" feature. In case the slaves are connected with the Windows PC, the integrated Windows EtherCAT Master is able to run and verify the system. If the slaves are connected with the control system, the master stack running on the controller will take over communication and provide all services and information to the EC-Engineer which are needed for diagnosis.